Brenton is just 30 years old and battling to live until his next birthday, after being diagnosed with Motor Neurone Disease (MND). Since diagnosis in May of 2014, Brenton’s condition has gone rapidly downhill. He is now wheelchair bound and as the condition progresses, he is struggling to talk and do anything for himself. This young man and his family are in need of your support. Brenton’s family, with Stroud Lions Club are holding a fundraiser on Saturday 17 January, 2015 at the Stroud Showground. An auction will be held for many fabulous donated items and a raffle is being drawn on the day with many generous prizes to be won, see the list of prizes at the bottom of this post. What can you do to support Brenton and his family? Attend the fundraiser at the Showground and invite your friends, there will be a motor show at the event, stalls and fun activities for the kids. Donation tins will be put around Stroud so you can contribute whenever you can. Brenton grew up in Stroud Road and his mum Julie still lives there. This courageous mum came to the Stroud Lions Club and asked them to help. Every dollar that you give will make this family’s life easier. 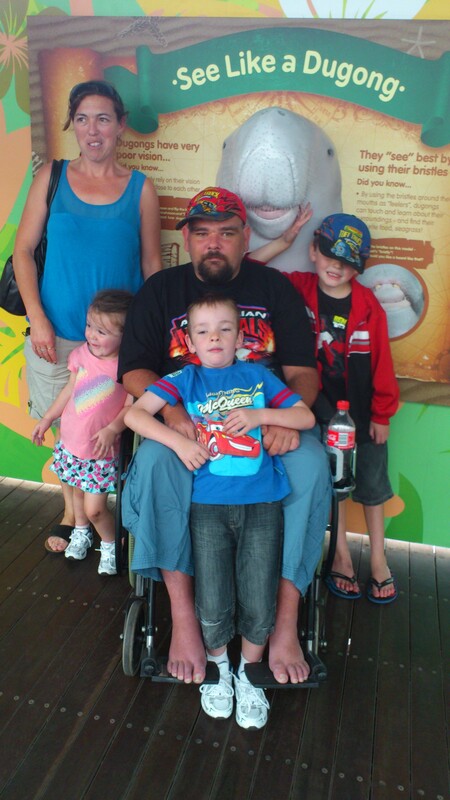 They desperately need a home in Medowie that Brenton can leave and return to in a wheelchair. At the moment he can only leave in a car and soon that will be only if it has a wheelchair lift. Time is of the essence as this is a rapid disease and we want his family to have every precious minute with their dad as easy as possible. Money will help this happen so be generous. We already have $445 in Brenton’s Bank Account . Stroud Men’s Shed are making a gauge to show how much we are giving. You can watch its progress at the Stroud Post Office.